Update 07/24/2018: An extension of the game has just been released, an update called No Mans Sky Next, of about 10Gb that introduces a huge amount of content to the game. It introduces multiplayer, the incorporation of new PvP and the possibility of sharing the same ecosystem with other players, and even allows the construction of databases with other users of other platforms. Preorders for No Mans Sky cd key (PC digital version) at the best price now available. 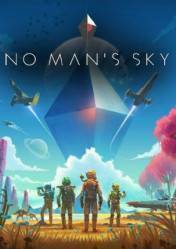 Since gocdkeys you can find the best place to buy the cd key No Mans Sky at online stores, completely secure and 100% reliable. No Mans Sky is a simulator of ships, where fighting and survival will be the cornerstone of the title. A huge galaxy to explore and constantly changing. We can visit every corner of this vast universe, from the most distant planets to the most impressive stars. In addition to performing missions, we´ll must combat and explore every corner of the galaxy, we´ll must collect materials and trade them in order to earn credits that we can use to enhance the combat capabilities of our ship, since improvements in weaponry, armor and shields upgrades, to increase the power of our thrusters. It has a multiplayer mode that we can explore and fight together with our friends. If you're a fan of Elite Dangerous and excite you open world RPG undoubtedly this is your game. Unlike its closest competitor, Elite Dangerous, in No Mans Sky we can visit every planet and walk around the area in search of materials and minerals to improve our craft. An adventure that will transport you to a conflicting and evolving universe. Despite the trouble it had at launch and all the negative feedback, the developers somehow managed to surprisingly bring this game back to a playable state. Great looking game and cool scope, but it's really underwhelming. Elite Dangerous is a much better experience. You don't really feel like you're exploring in this, just roaming. I wouldn't have recommended this at all a while back, This game used to be practically a joke because of all the promises that it never fulfilled. But with it's recent updates and plans for further updates, I have been having a lot of fun with it and I can now recommend it if your into these types of games! I pre-ordered this game, yes shame on me. The game started out as a 10 and ever other hour it went 1 point down. All the way to about a score of 3. But now finally they've added multiplayer and I'm looking forward to seeing what they have changed to the game. This game is great! i wonder when i can get it on pc hmmmmm anyways this game is a fun, grindy, and a game that feels like you won the world when you complete an objective that was taking forever. To play this game you really need patience and the ability to wait for the time you get there. Nice game and multiplayer update is awesome and fantastic totally recomended..
No Man's Sky Visions Update 1.75 First Impressions!! !